Pat Rogers interviews Lauren Luloff on the occasion of Luloff's exhibition Sun Drawn at Halsey Mckay Gallery, East Hampton, NY, on view through July 24, 2017. Rogers' introduction notes: "Created from bedsheets that are ripped into sections, painted and suspended, [Luloff's] new works are inspired by landscapes, nature and natural forms found in the Brooklyn cemetery and a nearby community garden, Luloff seeks peace and inspiration and soaks in the sensations being among nature allows. 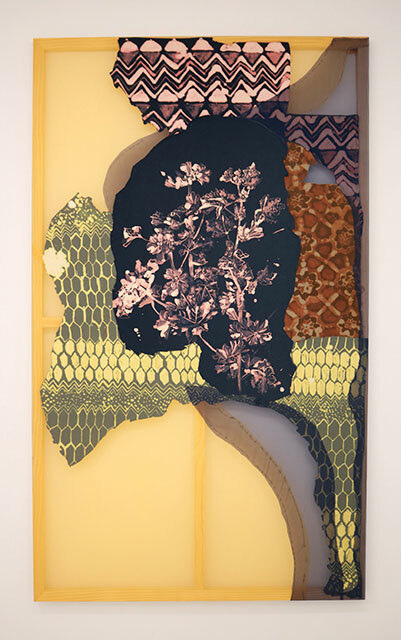 Hydrangeas, sunflowers, begonias, pine, spruce and hollyhock make their way into these mixed media works revealed through paintings on fabric that are collaged to create compositions that inspire introspection. Abandoning paint all together, the natural forms and patterns are created through painting with bleach on bedsheets. The bleach created a palette of subtle colors as undertones and contributes to ethereal sensations her work invokes."